Irrespective of Apple policy, we know that many of our readers already purchased a US iPad for use — gasp — outside of the United States. With favorable exchange rates and an early US launch really, who could blame you? But after notifying your local customs office and paying your government tithe, the very next thing you probably did was notice that you couldn’t buy iPad apps from your local iTunes app store. Now you can, at least if the sudden deluge of tweets and tips from Dutch, UK, German, Swiss and Canadian (like me) iPad owners now hitting Engadget inbox is any indication. Go ahead, give it a go and let us know the results in comments. 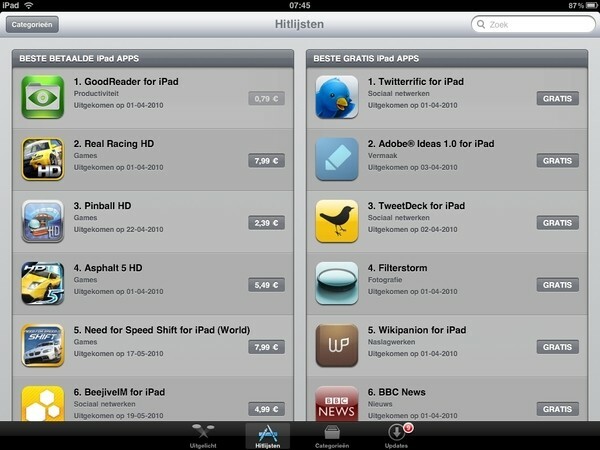 The app store is most certainly available in Canada now as I was able to install a new iPad application through it. Was is curious is the absense of the iBook application from the Canadian app store. Using the US iBook application with a Canadian iTunes account will lead to an empty iBook store… so it certainly is not ready yet. I will keep an eye an it and report when it becomes available.